Personal development, physical fitness, life skills, and self-defense through Gretna martial art and Taekwondo classes at Tiger-Rock Westbank. Classes for ages 4 and up! Welcome to Tiger-Rock Martial Arts of the Westbank! For over 40 years, Tiger-Rock Martial Arts has provided leading martial arts instruction to kids and adults in the New Orleans area. Our unique training program combines traditional martial arts, modern physical fitness, and timeless life skills. With classes for all age groups, you can start training at Tiger-Rock Martial Arts at any age. Start your child at Tiger-Rock Martial Arts! Enrolling your child into our Gretna martial arts and taekwondo classes will help them stay active, healthy, and confident. Moreover, martial arts can help kids in many ways off the mat, including improving their confidence and self-esteem. Tiger-Rock Martial Arts offers three levels of martial arts programs for kids—Tiger-Cubs, Juniors, and Teens. Each program has a unique curriculum that is designed to match the physical and cognitive development of your child. Our Tiger-Cubs program (ages 4 and 5) teaches the basics of martial arts. Students in our junior level Gretna martial arts and taekwondo class learn simple kicks, patterns, and symmetrical movements. The goal of this program is to help students develop the ability to follow instructions. Additionally, students will be able to develop all-important balance and coordination. Students in our Juniors Program (ages 6-11) participate in self-defense and physical fitness exercises with a martial arts twist. Your child will learn awesome kicking and striking techniques. Plus, your child will also learn about stranger awareness and how to protect themselves from bullies. Finally, our Teens Program (ages 12-15) incorporates many of the lessons taught our Juniors Program, but also integrates leadership training, advanced life skills education, and an overall higher level of martial arts instruction. Click here to sign your child up today! At Tiger-Rock of the Westbank, we’re often told by our adult students how much their lives have changed since they started training at our Gretna martial arts and taekwondo academy . Many share stories of a boost in confidence, reduced stress, weight loss, and overall difference in lifestyle. Tiger-Rock Martial Arts lessons for adults combine modern advances in physical fitness with the ancient traditions of martial arts to create a heart-pounding, calorie-burning workout! With classes held on weekday evenings and Saturday mornings, our adult martial arts program is designed around your schedule. Martial arts is proven to have incredible benefits for adults, including improving cardiovascular health, better flexibility, weight loss, and an overall improvement in physical fitness. Students can train at their own pace and absolutely no experience is necessary. 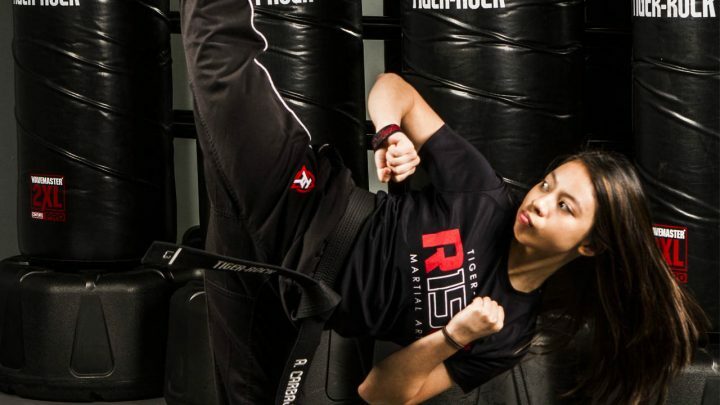 Learn more about our adult martial arts program! Check out the Westbank’s favorite martial arts academy! Tiger-Rock Martial Arts of the Westbank is located at 113 Lapalco Blvd # 208, Gretna, LA 70056. We’re open Monday—Saturday, offering leading taekwondo self-defense, physical fitness, and life skills training. We’ll see you on the mat! Get started at Tiger-Rock Martial Arts of the Westbank today!